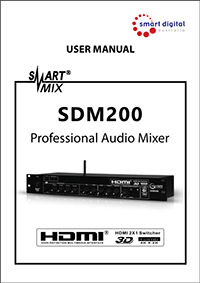 The all-new SDM200 is a unique professional audio mixer with built-in HDMI switcher. The SDM200 includes inputs for 4 microphones plus 2 HDMI. Compact in size, the unit is 1.6 RU rack mountable and weighs just 4 kg with 110/240 VAC selectable. The SDM200 is classical line mixer great for live performance, professional studios, pubs and clubs, as well as business and entertainment. 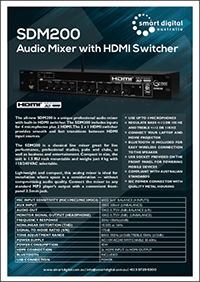 Lightweight and compact, with rackmountable design, this analog mixer is ideal for installation where space is a consideration - without compromising audio quality. Connect the mixer to any standard MP3 player's output with a convenient front-panel 3.5mm jack.